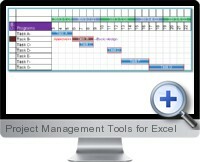 Project Management Tools for Excel (Blue Excel) provides a fast and easy way to create project Gantt schedules as well as several utilities useful for project management tasks and data analysis. The Excel add-ins are designed to make Excel work easier and faster with solutions for creating Gantt charts, updating data, finding differences between workbooks and more. Gantt Charts for a fast and simple way to show and share project planning and progress. Compare two columns of data and display differences. Enhanced merge of selected cells content in to one cell by maintaining layout. Find same cell in difference workbooks and switch between workbooks. This is useful to compare two workbooks or get data from another workbook. Update one sheet according the data from another sheet. This is useful for data merge. Make frequently used color fill tasks faster. Advanced data filtering capabilities with more criteria options per column. Customized Excel command tools to access menu items and functions much faster than through levels in the menu bar.